Engine 218 firehouse 650 Hart Street Bushwick, Brooklyn 11th Division, 28th Battalion "Bushwick Bomberos"
Note: Battalion 60 was organized to respond to alarms only and had no administrative responsibilities. It could be relocated where needed. Note: Elm Street renamed Hart Street. FF William Maurer, Engine 113's driver, died responding to a fire when he fell from steamer. Capt. William L. Casey, 15-year veteran, died as a result of injuries sustained while operating at a fire on February 1st. FF George P. Linnemann, 25-year veteran, died as a result of injuries sustained while operating at a Brooklyn 4th alarm fire. ^^^^^ Prior to BN*28 being organized at 271 (from BN*37-2 at 222) 218 was in BN*35....BN*60 rotated every third night from 1800 to 2400 hrs between BNs 35...44 & ?? acting as another Section (some great BCs & BN*FFs in the Unit) ...during the remaining hrs they were in Qtrs w/218 & responded at the Dispatchers discretion. ^^^^^^^ There was a photo in the Chicago Tribune of a Community Protest outside 218 during the "supposed fiscal crisis" in 1975 when they were threatened with closing...not sure if the photo was on here or ? FDNY Battalions had very high response activity in the 1960s and 1970s. In 1968, Bn 44-1 and Bn 44-2 responded to 11,598 combined runs. In 1971, 43 FDNY battalions responded to 3100 runs, many doing more than 5000 or 6000 runs. In 1973, 46 FDNY battalions responded to 3100 runs or more, Bn 56 responded 7123 times. It was not uncommon for dispatchers to ask on the radio - "Is there an available chief for a working fire?" 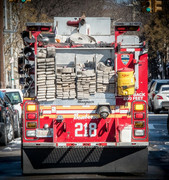 To reduce workloads, in the 1970s FDNY changed battalion locations, reassigned boxes, reduced units assigned for administration, introduced Adaptive Response, introduced Discretionary Response boxes and introduced ERS fire alarm boxes. "If these walls could talk- there are many buildings that have been around since before the paid Fire Department of the City of New York was organized that are still being used today. Then, there are some, no longer firehouses but still hold it's history inside the 4 walls. 1 building in particular at 155 Mercer Street, still shows signs of what it once was, 'Fireman's Hall'. Present day 155 Mercer Street is a clothing store with bright lights, but if you look beyond that, on the front facade, you can still see 'Fireman's Hall' carved into the building, spelling out it's rich history. January 6th, 1854, construction contracts were signed to build a new Fireman's Hall to replace the old building. A box was placed into the cornerstone containing the history of the New York Fire Department since 1816, a history of the old Fireman's Hall, a bible, a copy of the US Constitution & a score of other documents including copies of the local newspaper. The ground floor would house New York Hose Company 5 & Ladder Company 6 of the Volunteer Department. Each company is to have 15x90ft, which will be divided in 3 rooms. The front room for the apparatus, the center room for their meetings & the room in the rear for sitting & reading. The 2nd floor would contain a large meeting room, 38x71ft for meetings of the representatives, engineers & foremen, & the Exempt Firemen's Association. The 3rd floor held an identical sized room used as a library & reading room & smaller rooms for the librarian & committees. The front of the building is to be Connecticut brownstone, cut in the best manner. 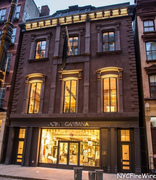 The style of architecture is Italian, or composition of Greek & Roman details applied by the Italians to modern buildings. An over-the-top example of Victorian exuberance, Field & Correja's Fireman's Hall exploded with decoration. Fireman's Hall was carved above the central 2nd floor window. The pilasters flanking the centered entrance were adorned with "emblems of the fire department, such as hook & ladders, torches, axes, trumpets, etc & tops of these antaes are to be surmounted with a fire hydrant". The architects salvaged an old fireman statue from the old fireman's hall. "On the top of the cornice is to be a blocking course with 3 pedestals. The 2 side ones surmounted with a cluster of torches & the center one with the full size statue of a firemen-- the same one that has stood sentry so many years in front of the old hall." A tympanum above the entrance doors contained bas-relief carvings of Protection & Benevolence & on it's keystone was carved a full-sized fire helmet. The volunteer fire companies were manned by locals called 'laddies.'. 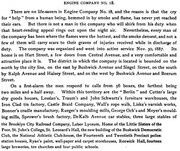 The companies gained a reputation as rowdy, boisterous gangs whose fire houses were essentially social clubs. Despite their elegant new surroundings, the men of New York Hose Company 5 & the Lafayette Hook & Ladder Company 6 were no different. When the Civil War erupted, Colonel Elmer E Ellsworth, a close friend of Abraham Lincoln, organized the 11th New York Volunteer Infantry Regiment known popularly as the Firemen's Regiment. The troops were in DC when insurgents attempted to burn down Willard's Hotel in DC on May 8th, 1861. Colonel Ellsworth, fusterated by a laddie's handling of the trumpet, snatched it. "With this he marshaled his forces". Less than 2 weeks later, on May 25th, it was reported that Colonel Ellsworth has been assasinated. His murder was fearfully & speedily revenged. His memory will be revered, his name respected & long after the rebellion shall have become a matter of history, his death will be regarded as martyrdom." That night, the board of Engineers & Foremen of the New York Fire Department met at Firemen's Hall to discuss participation in the Colonel's funeral. January 1865, there was a bill introduced in the State Senate to establish a paid professional Fire Department. A meeting of the Board of Representatives at Firemen's Hall resulted in a unanimous resolution to use "every honorable means to defeat the bill for a paid Fire Department". Their efforts failed. July 6th, 1865, the board met 'for the purpose of making a final close of their business". 2 weeks later the Commissioner of the new Metropolitan Fire Department met in Fireman's Hall to arrange for the transfer of property from the old volunteer companies to the new department. Fireman's Hall will be used as a Fire Department Headquarters. One of the 1st steps to modernize & consolidate the department was the installation of the 'Fire Alarm Telegraph' boxes, the predecessor of today's ERS boxes. The Central Station was located in Fireman's Hall. In 1887, Fire Department Headquarters moved to it's new building on West 67th Street. Fireman's Hall continued to operate as a firehouse. Ladder 20 organized March 30th 1889 here. Ladder 20-2 organized March 1st, 1900 until June 1905, then reorganized December 1905 until July 1939. Division 1 moved in January 30th 1894 until March 1, 1900. Division 2 was here from December 1914 until June 1917. Battalion 3 was here January 1894 on and off until 1922. Battalion 5 was here April 1959 until April 1974. Engine 13 moved in November 1948 until April 1974, when both Engine 13 & Ladder 20 both left for their new firehouse on Lafayette Street. At this time, the Victorian facade had been shaved flat, leaving only side quoins as any indication of the 1854 design. The fireman statue was salvaged." "At 12:01 a.m., the order came over emergency squawk boxes - 2,127 firefighters would be laid off by midnight. The city's Bravest protested by calling out sick at 10 times the normal rate. And when the ghettos began to burn, 14 firefighters at Engine Co. 218 in Bushwick, Brooklyn, could not respond. They were being held hostage by a neighborhood mob. "We weren't unhappy about it," said retired Lt. Eugene Welischar, whose men were held during the first three days of July 1975. "The neighborhood wanted to save the firehouse. We agreed with them.
" It worked. Twenty-five other firehouses were closed by the city in the 1970s fiscal crisis. But the city spared Engine 218 to win the release of the crew. With another round of FDNY cuts on the way, community activists are readying for battle again, and firefighters are quietly talking about sickouts. A top official said that if engine companies are closed, the city is "almost guaranteed" to come after the ones it did before. Engine companies that share houses with ladder companies are the most likely targets. When City Hall was looking to close firehouses in 1991, it relied on a computer to determine which companies could be shut. Engine Co. 218 was on the list. So was Engine 212 in Williamsburg, Brooklyn - the scene of another protest in 1975. Angry neighbors lived in Engine 212's firehouse for 16 months to force the city to reverse its decision to shutter it. "We'd be ready and willing to fight again," said Albina Jackanin, a member of The People's Firehouse, a group that grew out of 1975 protest. This time around, the nonprofit organization believes another nearby firehouse - Engine 229 - is in jeopardy. "If they don't remember what a bad idea it was to close firehouses before, the community is ready to remind them," said Daniel Rivera, executive director of The People's Firehouse." An assistant Fire Department commissioner went out yesterday to plead with angry residents of an area of Brooklyn's Bushwick section for the release of the 14 firemen they were holding hostage in protest against the shutting down of their neighborhood firehouse. Instead of winning their release, he succeeded only in being taken hostage himself. 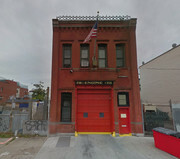 As many as 500 residents in the rundown area around Engine Company 218 at 650 Hart Street, had been blockading the front door of the century‐old firehouse since Monday, refusing to allow firemen to leave or equipment to he removed. The assistant commissioner, Vincent Collymore, went to the firehouse yesterday to remedy the situation. After conferring by telephone with Fire Commissioner John T. O'Hagan, he even gave the residents handwritten letter on Fire Department stationery promising help. The letter read: “Fire Commissioner John T. O'Hagan states that when the first monies are received that Engine Company 218 will be the first firehouse to he put back on active duty.” Twenty‐give other firehouses were also closed in the city's budget squeeze. The letter also said that Mr. Collymore would go personally with two members of the community to talk to Commissioner O'Hagan and then Mr. Collymore would return with the two to the firehouse. There was wild cheering in the street. The civil defense siren was touched off atop the firehouse and someone came down the street blowing a bugle. But the blockade continued. A spokesmen for the protesters said the hostages would be let out at 9 A.M., when the firehouse was actually returned to active duty." You left out Bn's 25 & 26 that were formerly Bn's 12-2 & 14-2, respectively. ^^^^^^BN*59 was originally in 275 to help BNs*50 & 54.....after they left 275 BN*51 was moved from 294 East to 308......& in 1984 when the Springfield Blvd FH was built & 326/160 were organized there BN*53 was moved South from 306 to 326 to help BN*54..... BN*59 was later at 319 with the idea of helping BNs*28 & 46 but this did not really do much as they were in the slower area of both BNs.....at the height of BN*46s high running years the Job took a number of the 46s Boxes & gave them to BN*52. I believe the comment from the 44 Aide, Seymore Schenker, was directed to TL-120. 120 was the Only individual company to do over 10,000 runs in 1 year, in 1971. There were many 2nd sections But, only 1 company has that distinction. Capt - You are correct. TL 120 had 10,989 runs in 1971.